Memorial Day 2013 is part of a series of piano miniatures I started at age 19. For every Memorial Day since then, I vowed to write a piano solo. Completing the first Memorial Day piece helped me out of a depressing year of sketching without finishing a musical work. In the previous year, I dropped out of college and worked odd jobs. 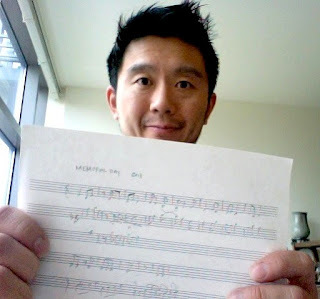 My unfinished musical sketches could have turned into an entire lifetime of incomplete projects. Luckily, I started these Memorial Day pieces. Memorials can be places of regret or a reminder. These solo piano works honor those who have passed in numerous ways. Memorial Day 2013 is a musical puzzle. Play it delicately, as often as needed. Contact me if you would like to buy the dedication for Memorial Day 2013 as a gift for a loved one.